Increasing and measuring employee engagement is a priority for most companies, and yet how to achieve and maintain high levels of engagement remains elusive for most Human Resources (HR) teams. The pressure mounts as HR professionals attempt to sift through a rapidly-expanding vendor landscape of software solutions designed for this exact purpose. Key to improving employee happiness, well-being, and commitment to a company’s culture and business objectives is a need to view employees as a customer of the business. At Zendesk we believe companies should ask: How are we serving our employees? The great news is that by harnessing digital solutions, HR teams can improve employee engagement. 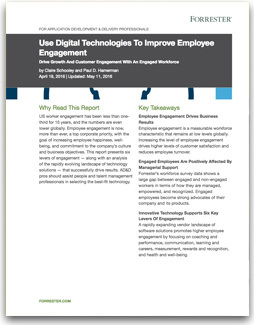 In this April 2016 report from Forrester Research, Inc. by Claire Schooley and Paul D. Hamerman, you’ll learn why employee engagement is a corporate imperative today and why taking a digital approach will reduce employee turnover and lead to higher levels of customer satisfaction.